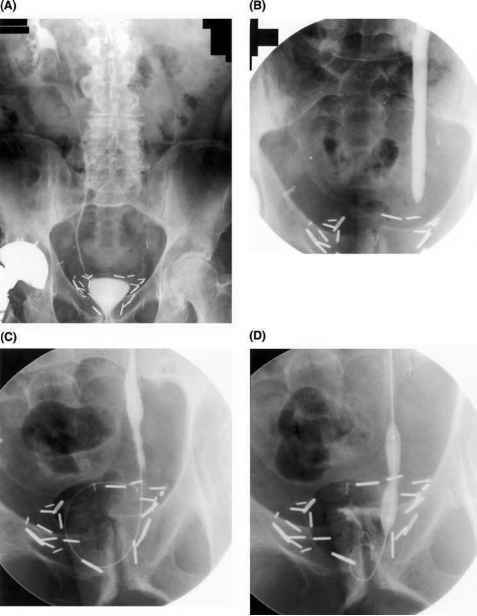 Radionuclide imaging is an example of a functional rather than a structural imaging method. It provides information on the hemodynamic effect of a stenosis. Figure 5 Contrast-enhanced ultrasound. (A) Unenhanced color Doppler image (shown here in gray scale) in the same patient shown in Figure 2. (B) Scan performed immediately after the administration of ultrasound contrast. Note the considerable increase in the color Doppler signal (shown here in gray scale). Source: Courtesy of James Pilcher, St George's Hospital, London. As mentioned earlier, ACE inhibitors block the conversion of angiotensin I to angiotensin II. This results in a decreased filtration rate in patients with RAS. The detection of an increase in transit time of the tracer through the kidney, as a result of the change in GFR, is the basis of this test. Renography is performed with 99mTC-MAG3, the preferred agent, or 99mTC-DTPA. The test is performed before and an hour after the administration of an oral ACE inhibitor, usually 25 mg of captopril, on two consecutive days. Alternatively the post-captopril study may be performed first. If this is entirely normal, it obviates the need for a baseline study (51). Patients must not take ACE inhibitors for at least two days prior to the test. Sequential images are obtained for 30 minutes after the injection of the radiopharmaceutical and a time-activity curve generated. An increased time-to-peak of tracer in the kidney and an increased mean transit time suggest RAS (Fig. 6A, B). Changes may also be observed in the differential function. Obstruction of the kidney should be excluded before the test. Figure 6 Captopril renogram in a patient with right RAS. 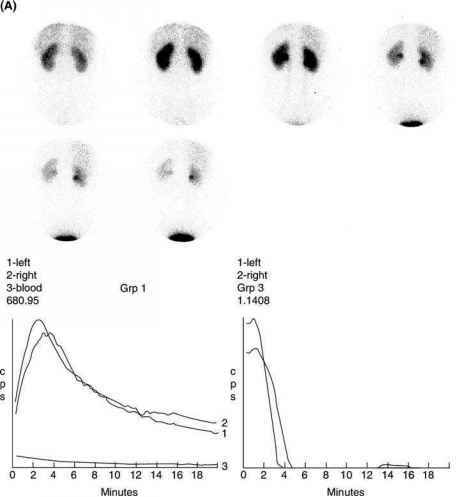 (A) The baseline study (posterior images) shows normal uptake and excretion of tracer by both kidneys. (B) Post-captopril study. The left kidney continues to demonstrate normal uptake and transit of tracer (trace 1 on the left-hand graph). 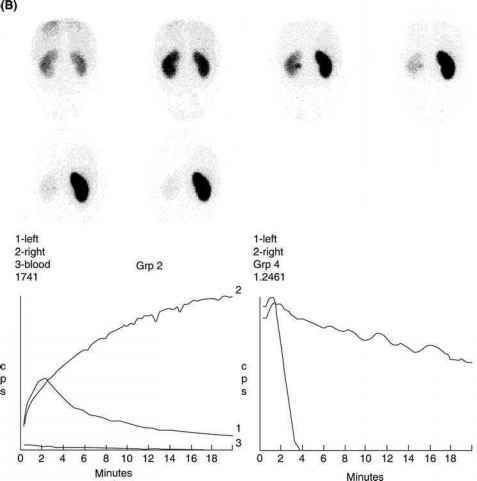 The right kidney has not peaked at 18 minutes and there is poor transit of tracer through the kidney (trace 2 on the left-hand graph). Abbreviation: RAS, renal artery stenosis. Source: Courtesy of Nigel Beharry, St. George's Hospital, London. sensitivity fell drastically. Bilateral disease, urinary obstruction, dehydration, and chronic use of ACE inhibitors all decrease the sensitivity of the test (29). Finally, scintigraphy also provides valuable information about divided function and can ascertain whether a kidney is worth revascularizing.